Flaxton Gardens has recently partnered with a local Sunshine Coast Camel Milk dairy to bring to our customers a dessert with a difference! QCamel is a family-owned dairy near the Glasshouse Mountains and was the first to produce pasteurised Camel Milk in Australia. Lovingly made using ethical, organic and sustainable farming practices, their camels are pasture fed in a no-cull environment where they share the milk with the calves. Their Camel Milk is not only delicious but assists with restoring a healthy gut and bowel. QCamel Milk is uniquely free of betacasein and beta-lactoglobulin and is an easily digestible source of calcium, vitamin C and lactoferrin. 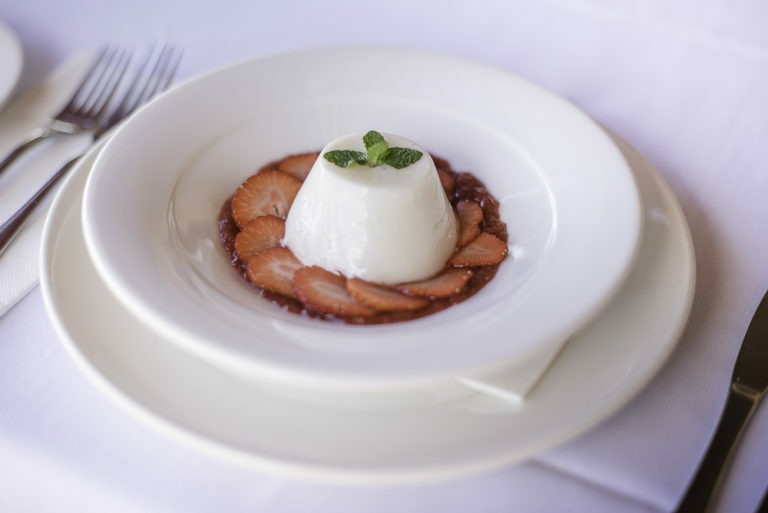 As part of our August-September Seasonal Menu, our Flaxton Gardens Executive Chef, Alan Thompson, has created a delicious dessert, Camel Milk & Vanilla Bean Panacotta with Rhubarb (pictured below). The Camel Milk is beautifully sweet to taste and has a very smooth texture compared to cow’s milk. The sweetness of the Camel Milk balances well with the tartness of the Rhubarb. This dessert really deserves a taste when you are next at Flaxton Gardens! Take a look at the rest of our fresh Seasonal Menu for August-September.